Barbara Stanwyck is hardly one of my favourite actresses, but in 1941 she made two glorious comedies for which I am eternally grateful. One was the Preston Sturges classic The Lady Eve, opposite Henry Fonda, and the other was Ball of Fire, the Howard Hawks hit in which she starred with Gary Cooper. She was never sexier than when she played the worldly-wise cardshark in the former film or the jive-talking gangster’s moll in the latter – and her stock-in-trade was making blithering, quivering chumps out of naive academics, while showing a lot of leg and a morsel of midriff. 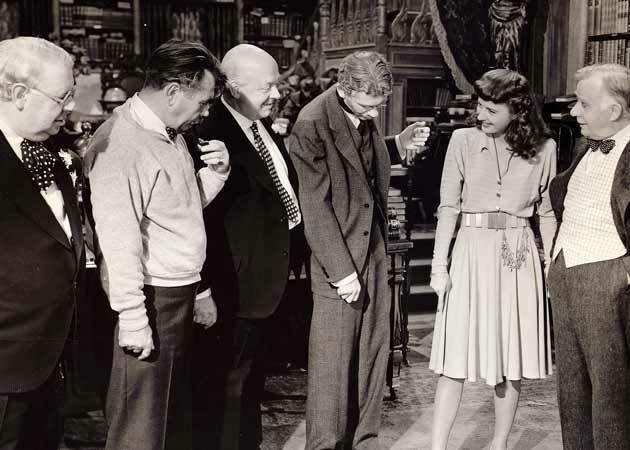 Ball of Fire, which boasts a sparkling and intelligent script by Billy Wilder and Charles Brackett, is – in true screwball comedy style – the story of what happens when opposite worlds collide. And speaking of the Swing Era, this film is also notable for the fantastic musical number, Drum Boogie, which is our introduction to Sugarpuss. She sings (or rather, mimes – the vocal was apparently done by Martha Tilton) it with the big band led by drummer Gene Krupa, a band in which one non-white face stands out – that of trumpet great Roy Eldridge. Hawks added the brilliant coda of Match Boogie, in which Krupa drums with a box of matches, at the last minute when he saw the bandleader doing his party trick. Cooper and Stanwyck make for a cracking couple in this movie; the chemistry is terrific (as as it was between Stanny and Henry Fonda in The Lady Eve). They are both at their most gorgeous, and are beautifully photographed – by the great Gregg Toland (whose most famous film, Citizen Kane, was made that same year), who had the brainwave of having Stanwyck filmed in blackface for a scene in which the romantic leads had to be in total darkness and unable to see each other’s faces. And another reason for film buffs to love Ball of Fire is the motley crew of familiar character actors who play the other professors – Henry Travers, who would be best known as Clarence in It’s aWonderful Life, crusty Oscar Homolka who was also prominently featured in I Remember Mama, and two of my favourites SZ “Cuddles” Sakall and the twitchy Richard Hayden as the aptly named Professor Oddly. Hawks and Gregg Toland were reunited seven years later for the inferior remake, A Song Is Born, which starred Danny Kaye and Virginia Mayo and was, said Hawks later, “a horrible experience” to make. (Toland died not long afterwards. ) It’s not as bad to watch as you might think – the presence of such jazz greats (Hawks was a true jazz fan) as Louis Armstrong and Benny Goodman is a redeeming feature – but it’s not a patch on the original, one of the finest films of the 1940s, and of the all-time great comedies. * Ball of Fire is out this week on region 2 DVD for the first time, exclusive to HMV. One of my favorite movies! It’s just so much fun! My friend and I love watching it together and quoting all the lines. After Bringing Up Baby, this is my favorite Howard Hawks movie.